First, your data—the field (or fields) from your data file that you want to convert to a barcode. Along with this, the data must be formatted to the specifications required by the barcode you want to create as each type requires a specific format, length, checksum, and so on. Luckily, the next item will take care of this formatting for you. Next, you need to acquire a third-party Barcode Font UFL (User Function Library). 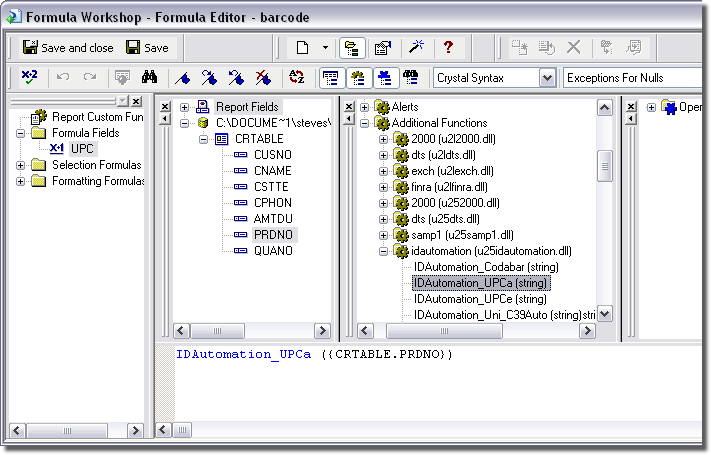 This UFL adds a set of Crystal functions to the formula editor for each barcode the vendor supports. Each function converts a string or data field to the proper format based on the desired barcode type. You use these functions with your data field like you would any other Crystal function. Without the function to first process the data, the barcode will not scan correctly. Lastly, you need a font package for the barcode to be generated. The same UFL vendor will offer (always for a fee) corresponding fonts for any barcode you want to create. 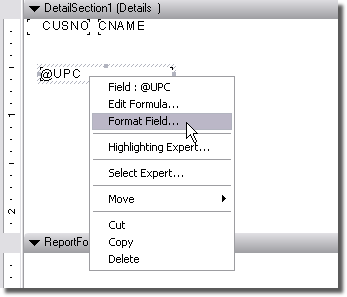 Once the CRO formula field is added to the report layout, it must be formatted to use the barcode font that corresponds to the function. So, if you use the UPC function, then you must format the new field with the UPC font. In the section that follows we will detail the use of a UFL and font to generate a UPC type barcode. 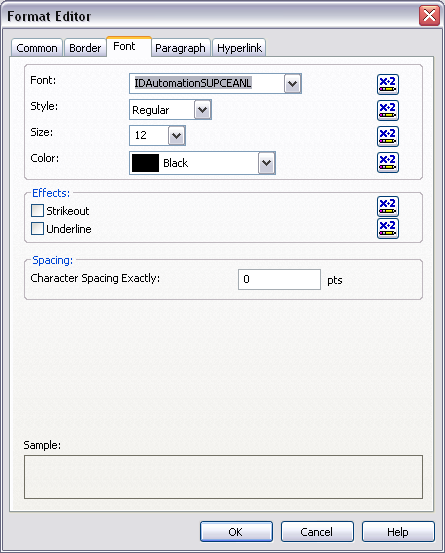 The UFL and font package used are a demo version offered by IDAutomation.com. A web search for ‘Crystal Barcode Fonts’ will yield many vendors for you to choose from. Once you have a font UFL and font set downloaded and installed on your PC, use the following steps to create and format a barcode in CRO. Either create a new Client Report, or open an existing report for design. Inside the designer, right-click Formula Fields in the left panel and select New. Give the new formula a name and press OK to continue. Starting with a blank Formula Editor, expand the Additional Functions in the center function section to locate the third-party barcode functions. Here we see the IDAutomation functions. 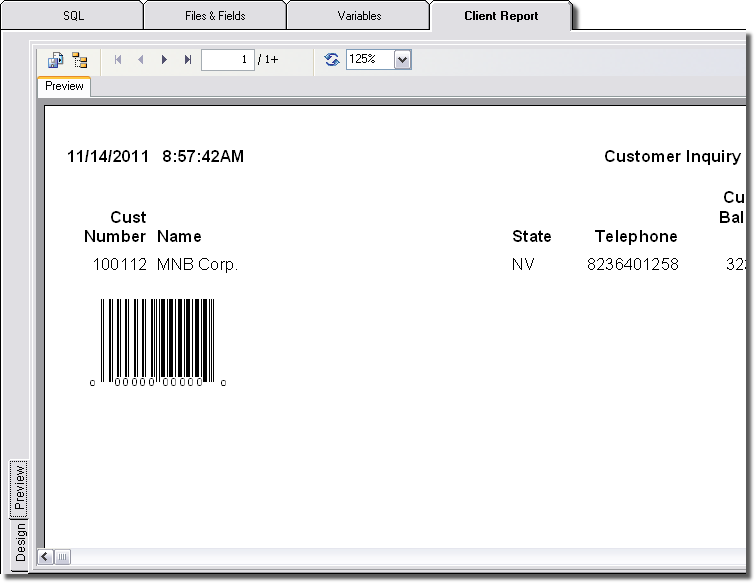 Double-click the function that corresponds to the barcode you want to create. In this example the UPC-a barcode function is selected. To apply the function to a data field, place your cursor between the two parenthesis of the function and double-click the appropriate field from the CRTABLE field list. The field (PRDNO in the example) is placed inside the function. Press Save and Close to return to the report editor. 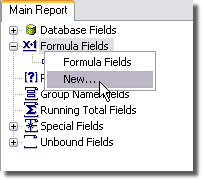 Drag-and-drop the new formula field from the field list in the left panel of the designer to the detail section (in most cases) of the report. Now you need to format the field with the correct barcode font. Right-click the field, and select Format Field from the menu. In the Format Editor, open the Font tab and use the Font drop-down to choose a font. Remember you have to use a font that corresponds to the barcode type function selected for the field. In this example a UPC function was used, so a corresponding UPC font is selected. Typically a 12pt font is used. Many of the fonts have a small, medium, and large option that sets the overall size of the final barcode. You can experiment with this combination to create the size you prefer. Press OK to exit and save your changes. Back at the report editor, press the Preview tab to see how the barcode will look. Finally, just save the report and you are ready to print your barcodes. If you plan to use a ViewPoint server to process your barcode report with the Run Remote command (RUNRMTCMD), a registry key is required on the server PC.